D&AD awarded just two Black Pencils at the first D&AD Impact Awards for socially responsible work, presented Tuesday night at Advertising Week New York XIII, in conjunction with Stillwell Partners, the parent company of the industry gathering. Author and comedian Baratunde Thurston hosted the awards show and Sting performed for the winners. 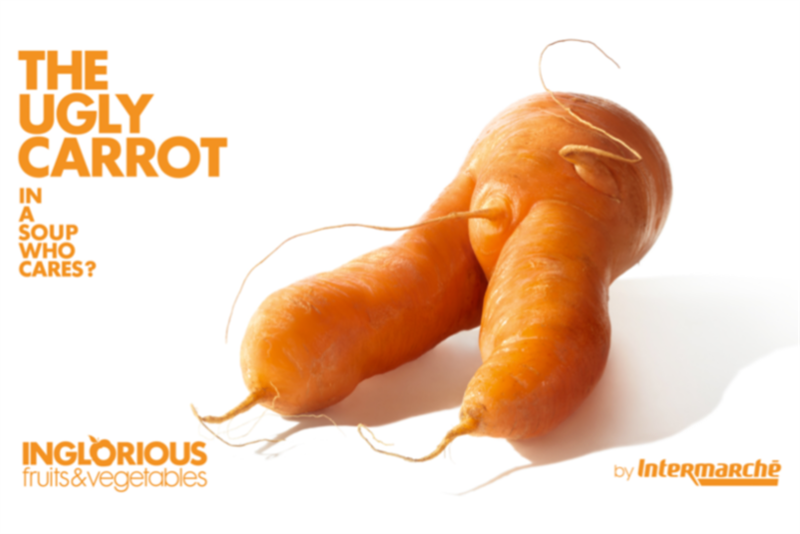 Paris-based agency Marcel won its Black Pencil for the "Inglorious Fruits and Vegetables" campaign for French supermarket Intermarché, which helped reduce food waste by marketing and selling less-than-perfect fruits and vegetables at a discount. Grey Canada also won a Black Pencil for the "Taking Aim at Corporate America" campaign (also called "Groceries not Guns") for the firearms safety group Moms Demand Action For Gun Sense in America. It targeted the grocery chain Kroger, which allows patrons to carry firearms openly in states where it is legal for them to do so, contrasting those weapons with other, less dangerous objects that are banned in Kroger stores, like pets and skateboards. D&AD awarded 20 White Pencils to agencies and organizations whose work furthered social change. Winners include R/GA and The Ad Council for "Love Has No Labels," Droga5 and Honeymaid for "This is Wholesome," DAVID Buenos Aires and MACMA for "MANBOOBS4BOOBS," Venables Bell & Partners and REI for "#OptOutside," Leo Burnett Toronto, Chicago and London, Holler and Procter & Gamble for "Like A Girl" and BBDO India and P&G India for "Share The Load." Judges included Jamie Oliver, Richard Curtis, David Droga, Squarespace CEO Anthony Casalena, Airbnb Head of Marketing Alex Dimiziani, Chief Girl Expert at the Girl Scouts of America Andrea Bastiani Archibald and One Young World founder Kate Robertson. The D&AD Impact Awards are intended to encourage work that benefits society as well as a company’s bottom line. They span 12 disciplines: communication and interaction, community, diversity and equality, education, environmental sustainability, financial empowerment, humanitarian aid, health and wellness, industry evolution, government engagement, responsible production and consumption and urban living. The other White Pencil recipients were We Believers and Saltwater Brewery for "Edible Six Pack Rings," J. Walter Thompson Colombia and Casa Luker for "Lifesaver Backpack," Pinkwater & Putman and the Coalition of Immokalee Workers for the "Fair Food Program" branding campaign, Cohn and Jansen JWT and Valvis Holding for "Purity Test," J.Walter Thompson Bangkok, Thai Samsung Electronics and the Thai Association of The Blind for "Touchable Ink," Ogilvy & Mather, Mumbai and Make Love Not Scars for "Beauty Tips by Reshma," Colenso BBDO and DB Breweries, DB Export for "Brewtroleum," GREY London, Ryman and Monotype for "Ryman Eco," BeeInventive for "Flow Hive," Forsman & Bodenfors and Coop for "The Organic Effect," Publicis London and Depaul UK for "Depaul Box Co," PHD India and Hindustan Unilever Limited for "The Story of an Unborn Child – Chamki," Edelman Deportivo and Hövding for "Give a Beep" and DigitasLBi North America and Whirlpool for "Care Counts." In addition, Graphite Pencils were awarded for 26 campaigns, including GPY&R Melbourne and Brisbane Melanoma Patients Australia for "Melanoma Likes Me," CogniToys and Elemental Path for "The CogniToys Dino" and McCann New York and Lockheed Martin for "The Field Trip to Mars." Wood Pencils were awarded for 39 campaigns, including Leo Burnett Chicago and Chicago Ideas for "Music Vs Gun Violence," Weber Shandwick and Mattel for the Barbie campaign "Evolve the Doll" and FCB Inferno and Sport England for "This Girl Can." Mars calls $520m media-buying review outside U.S.